The South Park is a good place to take beginners and intermediates away from crowds of the Schoolroom. 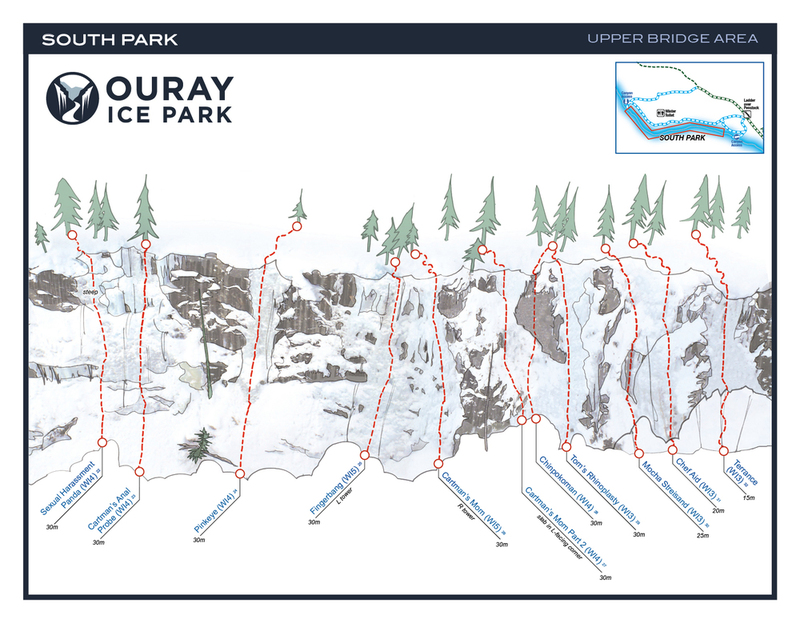 A five to ten minute walk along the ice park trail will lead you to signs designating the South Park area. Anchors are generally built from trees and ice screws or a combination of both. Some of the trees are a short distance away from the top of the routes and others are a greater distance. It is helpful to have extra rope or cord to build anchors here. Walk down to the base of the climbs in on the down riverside via a trail and fixed rope down a hill. The canyon is fairly wide here and makes for a nice place to hang out at the base of routes, preferably not right beneath them.